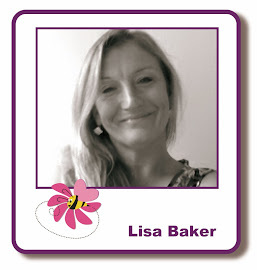 Good morning crafters, Julie here, I hope I find you well today? 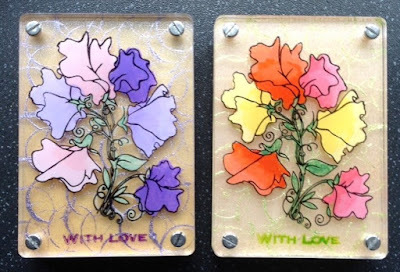 Today I have 2 That's Crafty Acrylic ATCs that I decorated with Hobby Art's Sweet Peas stamp set to show you. I've made these for Mother's Day (coming up this Sunday for anyone who didn't realise) as I thought they were a nice little present and keepsake. I'll just write one up for you, as both were very similar and the process is the same apart from the colours I used. I've made a few of these lovely little plaques this year for special birthdays and I'm always really pleased with the finished project. They are not as complicated as they look and I think they make lovely little presents. I have some of the mini easels to go with these as part of the present (but you don't have to have the stands though, as they stand well on their own). The kit comes with 2 thinner acrylic rectangles and 1 thicker one, an MDF back and 4 nuts and bolts (the holes are pre-drilled). Every piece of acrylic comes complete with a protective film on each side to protect from any scratches during manufacture and you must remember to remove these before you work on each layer (the first plaque I ever made I only removed one side and it wasn't the side I'd stamped on!). I stamped my small sweet pea image from the Hobby Art Sweet Peas stamp set in Stazon Jet Black ink on the thickest piece of acrylic (remembering to remove the protective film from it first - I always leave the other side protective film on until I'm finished, just in case they is something on my work space that could scratch the acrylic face). Also don't worry if your stamped image didn't work out right the first time either -nothing is lost if you have some alcohol blending solution to hand, simply wipe this over the surface with kitchen towel, make sure it's dry and re-stamp until you get a perfect image. I then set this layer aside to dry. 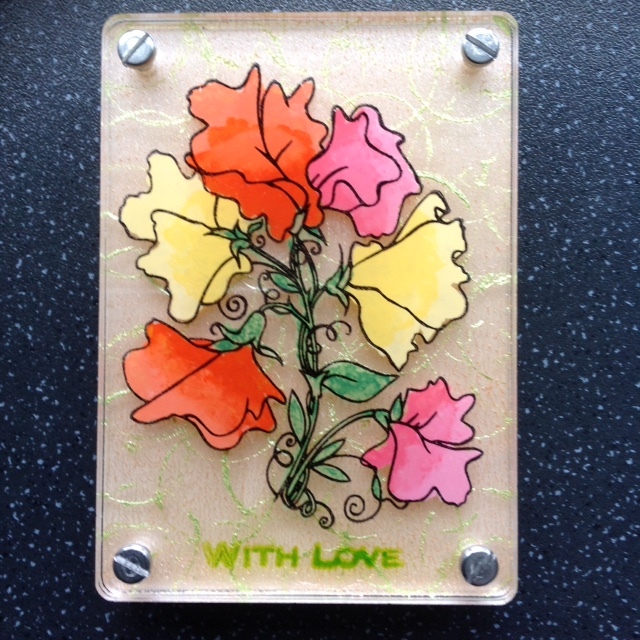 I then took the next layer of acrylic removed the film and stamped 'With Love' from the same Hobby Art stamp set in Eden Green Stazon ink and set this aside to dry. 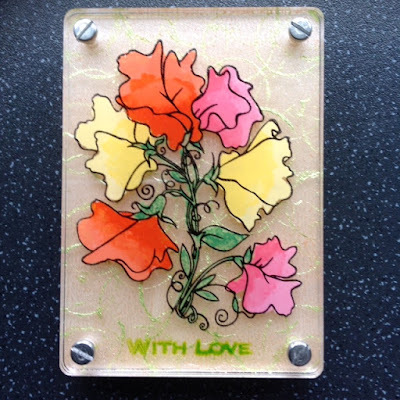 Then I was onto the final layer of acrylic which (after removing one protective film) I brayered this with Passion Flower Starlights and once dry added circle of interest using an old lipstick lid and some Apple Green Starlights, this was then set aside to dry. The MDF layer I painted with Americana Decor chalk paint in Delicate (pastel yellow) and set this aside to dry. 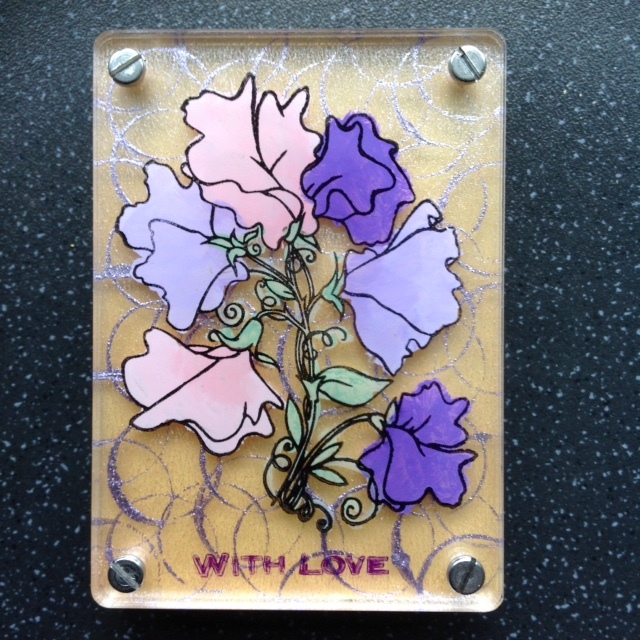 I returned to my first layer and painted the sweet peas in using acrylic paint and set this aside to dry. This is the only layer that I worked from the back on. When everything was completely dry ( I left overnight to be sure) I removed the other protective film layers and assembled my stacks (sweet pea layer, then With Love, then starlight brayered layer finishing with the MDF back). 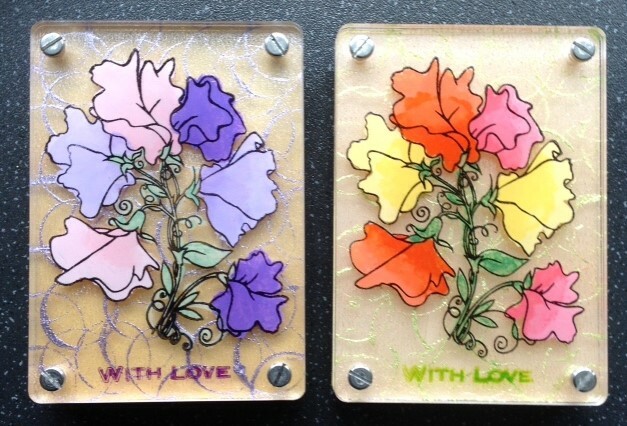 Labels: craft classes, Hobby Art, Julie Emmett, Lisa B Designs, Maidstone, Starlights, Sweet Peas, That's Crafty!